I am a retired dental hygienist with 45 years experience in dentistry. My husband Rick and I retired to Lake Chapala five years ago. We are located 40 miles south of Guadalajara. When we vacationed there before retiring I noticed a great need for dental care. I knew I could help. 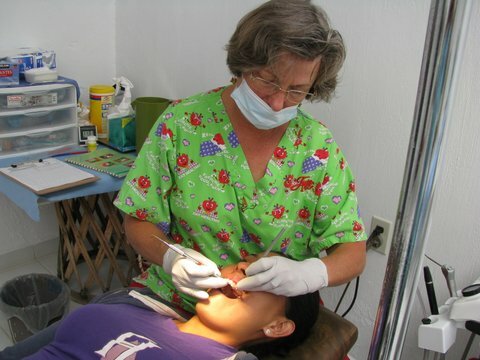 Two and a half years ago I answered an ad to organize a dental clinic in the Tepehua Community Center. I expected to find something, but there was nothing resembling a dental clinic. I had brought 70 toothbrushes and my three sets of hand instruments I purchased in school 30 years ago. I bought a camping flashlight that fit on my head. I gathered up my yoga mat, a bone pillow, and a sheet. I set up on a plastic folding table, stacked up three plastic patio chairs to sit at a height I could work and began to clean my first patient’s teeth. She had never had her teeth cleaned before. Three weeks later I worked standing with my patients lying on a raised bed. I have gifts in innovation, organization, compassion, knowledge, teaching, and a passion for dentistry, and a passion to serve. I serve the poor in Tepehua Community Center. Through God’s provision, I now have a separate building with three dental chairs. Four Mexican dentists have joined me to help provide services three days a week. We are all volunteers providing dentistry through donations. Half of the Mexican people live below their poverty line, where minimum wage is about five dollars a day. They suffer more health and dental problems, and need help with nutrition and dental hygiene. I need supplies such as, gloves, gauze, toothbrushes, toothbrushes, toothpaste, pain meds, antibiotics, instruments, dental supplies and repairs to equipment. I can buy most of what I need with $300 a month. That is 30 people donating $10 a month. Donations to www.tepehua.org are tax deductible.